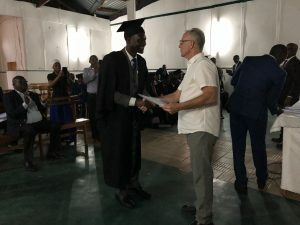 Today, Friday, October 19, was a banner day for Global Baptist Training Foundation and for more than 50 Rwandan pastors. 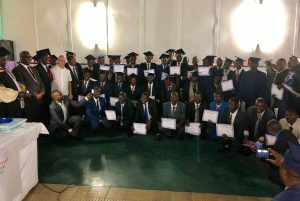 Today, in addition to a completion certificate for our “Evangelism and Church Planting” course, most of them received a graduation certificate for “GBTF Level One Theological Studies!” These pastors have successfully completed all our level one course work. This includes: Interpretation of Scripture, Bibliology/Anthropology/Christology, Soteriology, Ecclesiology, Expository Preaching/Sermon Preparation, Evangelism/Church Planting. This course of study takes seven separate courses. The pastors had their families and others come to town. Many of them found caps and gowns!! It was a day of hard work as Bruce and our hosts went back through the records and verified each pastor’s completion of each course. Heavy rains forced everything, including the pictures, inside. But the joy was overflowing. You may remember that the Rwandan government handed down a new requirement for all pastors. Beginning in January, 2019, all pastors must show proof of training. It is lost on no one that God orchestrated GBTF in Rwanda long before this new requirement was even a thought. 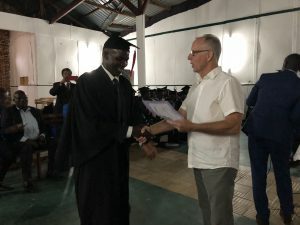 The Rwandan pastors send their heartfelt thanks to all those who have made their education a reality, especially an amazing couple who have adopted this Rwandan class and have underwritten most of the cost from the very beginning! Most of the pastors will begin level two training in July. For those pastors who may have missed one or more class, the Rwandan trainers that Bruce has been preparing will do the make-up classes! It doesn’t get much better! Can you tell we are thrilled, thankful, and fulfilled? Next week, we begin a brand new classroom in Uganda! Look for updates as about 50 pastors come to begin this same journey of training and equipping for greater and more effective ministry to their churches, communities, and nations. PS. The Rwandan building repair has begun. We have a thank you video, but the internet is too weak to send more than a 30-45 second video. We will send it out after Bruce returns to the states! !